Amazing, crumbly, tender, tasty cookies.. Separate whites from yolks; put whites in fridge. Mix 1,5 glass of flour with softened butter or margarine. Mix curd in, yolks, slaked soda and add flour, to get soft, plastic and not sticky to hands dough. Wrap dough with film, and put in cold place for a day (but if you are lack of time – minimum for 30 min, till hardening). Mix whites into steep foam and gradually add sugar. At the end mix ground nuts in. Roll each part one by one on sprinkled with flour table into rectangular layer, 1~3mm thick. (The thinner you roll out the dough, the product will be more graceful). Smear layer on top with meringue and wrap in roll. Cut roll in slices of 5~6cm or 2 сm, depending on, what cookies you need — soft or crunchy. Put the resulting bars on a baking sheet (greased or covered with baking paper) at distance of ~5 сm from each other. Put on the heated at 160~170°С oven till brown (30~45 min). 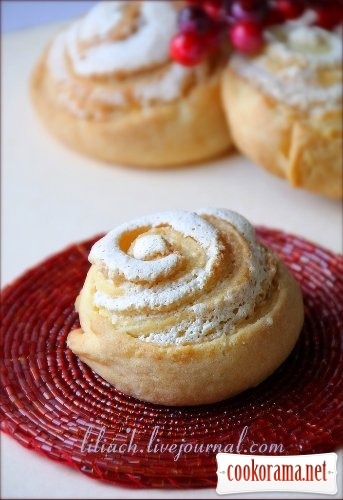 Top of recipe "Curd cookies "Roses""
а как на вкус ? вот прямо по этому рецепту готовили на уроке ? Recipes, Cookies, Curd cookies "Roses"